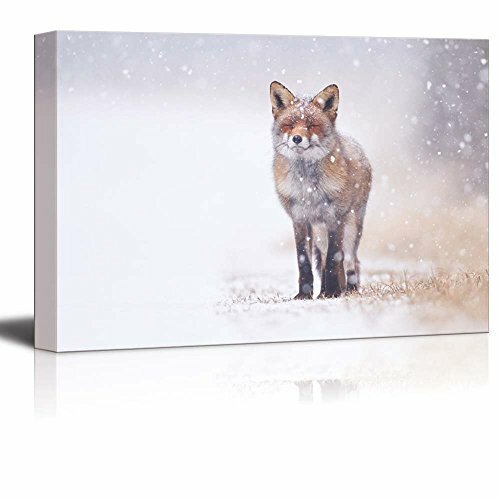 Canvas Prints Wall Art - Red Fox in The Snow | Modern Wall Decor/Home Decoration Stretched Gallery Canvas Wrap Giclee Print & Ready to Hang - 16" x 24"
Beautiful canvas art, sturdy, well made. This is just gorgeous! Love it, looks so good on the wall. Love this...Even more beautiful than it shows. I never buy art online so very pleased with my 1st. Love this picture, really striking, great quality and price. I was hesitant about purchasing online. Price seemed too good for the size. But it was just as described and was made of quality material. Love, love, love this print! Excellent price for the quality! Really love it.... fox appears to be just coming out through the snowy background.